(TORONTO, ON – October 23, 2015) The beautiful Luxury Sport Coupe welcomes a new member to the family, as the Lexus RC 300 joins the RC 350 for 2016. Both combine bold styling with highly responsive driving dynamics – plus the intangible appeal of a pure coupe design that promises an exhilarating driving experience. Both models feature a low profile, compact cabin, bold fender flares and a wide stance. The body is clad with a unique five-layer paint process and finished with a plethora of premium details, including a power moon roof, LED headlamps, rear tail lamps/brake lamps, daytime running lights and clearance lamps, and power folding, heated exterior mirrors with integrated puddle lamps. The RC 300, now at a lower entry point price than previous RC’s, is immediately recognizable by its LED fog lamps. Once inside, drivers will fall in love with the RC’s sporty and elegant 2 2 coupe interior – featuring luxury finishes, striking upward-facing ambient LED lighting and intuitive technologies. These combine to hint at the pleasures to come from the drive ahead. On the road, guests will delight with the RC’s agile performance. A 3.5L V6 delivers up to 255 horsepower in the RC 300 (and up to a more powerful 307 horsepower in the RC 350), while driving dynamics systems from steering to suspension have been carefully tuned to focus on handling agility. All RC models feature a six-speed automatic transmission with sequential shift mode operation and paddle shifters, plus the added all-weather driving confidence of the Lexus AWD-i-Four system with electronically-controlled centre differential. Handling and control technologies include Vehicle Dynamics Integrated Management (with an off button), three-setting drive mode select (for Sport, Normal and Eco modes) to match a driver’s mood and driving style, sport-tuned electric power steering, ventilated disc brakes, and more. The all-new 2016 Lexus RC 300 AWD (Starting MSRP: $48,050) is offered at a Premium grade as standard and fitted with a long list of premium features. The 10-speaker Lexus Premium Audio system features integrated XM Satellite Radio and a seven-inch display screen and Bluetooth connectivity. The dual-zone automatic climate control features eco air conditioning, while power-adjustable front seats clad in NuLuxe and the steering wheel are heated for extra comfort year-round. A 60/40 split fold-down rear seat maximizes versatility and cargo-carrying capacity. Other standard features include 18” alloy wheels, an eco-drive monitor, water repellent door glass, a HomeLink universal transceiver, keyless entry, the Lexus Smart Key System with Push Button Start and the signature Lexus analogue clock with LED illumination. Safety systems include a standard back-up camera, an onboard first-aid kit, anti-theft system, and more. 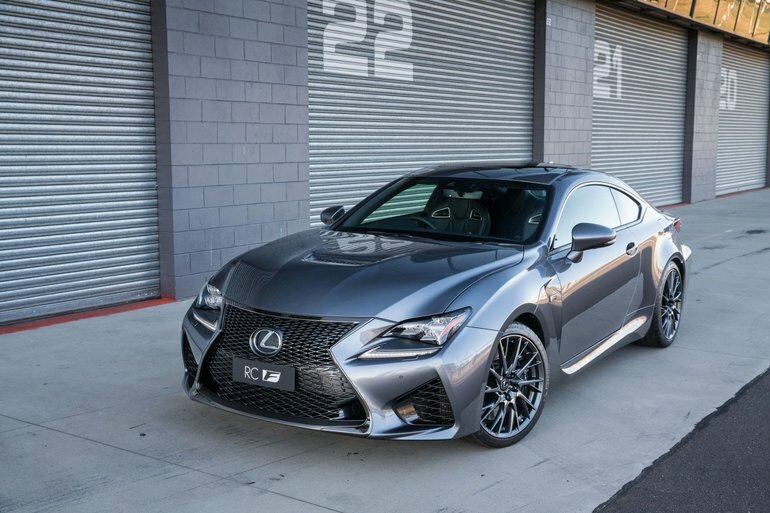 The RC 300 AWD may be enhanced with the F SPORT Series 2 package, which adds several track-ready systems and details, including adaptive variable front and rear suspensions, 19” alloy wheels, F SPORT steering wheel and seats, a full TFT instrument cluster inspired by the Lexus LFA Super Car and the Active Sound Control system to enhance engine and tailpipe sounds. This model also receives a navigation system, air conditioned front seats with driver’s seat memory, automatic wipers, the Lexus Blind Spot Monitor and Rear Cross Traffic Alert safety systems, and more. For 2016, the RC 350 AWD is offered standard equipped with the F SPORT Series 1 package (Starting MSRP: $58,250). This model includes many features designed to deliver track-inspired performance and handling for an engaging experience behind the wheel. In addition to many features found on the RC 300 AWD, this model is standard equipped with a navigation system, air conditioned F SPORT front seats with a driver’s seat memory system, a full TFT instrument cluster inspired by the Lexus LFA Super Car and the Active Sound Control system to enhance engine and tailpipe sounds. Performance and handling features include Adaptive Variable Suspension and 19” alloy wheels. This model is also fitted with a number of signature F SPORT styling cues, including F SPORT alloy wheels, trim, pedals, heated steering wheel, shift knob, scuff plates, sport seats, and more. Other features included as standard include Lexus “L” motif LED headlamps, as well as Blind Spot Monitor and Rear Cross Traffic Alert safety systems, a back-up camera, automatic wipers and more. This model may also be ordered with an F SPORT Series 2 package (MSRP: $53,400), which adds luxury and technology features including a 17-speaker Mark Levinson Audio System, the Lexus Pre-Collision System, dynamic radar cruise control and intuitive parking assist. The 2016 Lexus RC 300 is on sale now, with the RC 350 following close behind and available this winter at Lexus Dealers across Canada. For more information on features and specifications, visit www.lexus.ca/rc.